I know what you're thinking about that title, at least if you are someone who has a potty mouth like I do. BFD. Big effing deal, right? But it's not what you think. 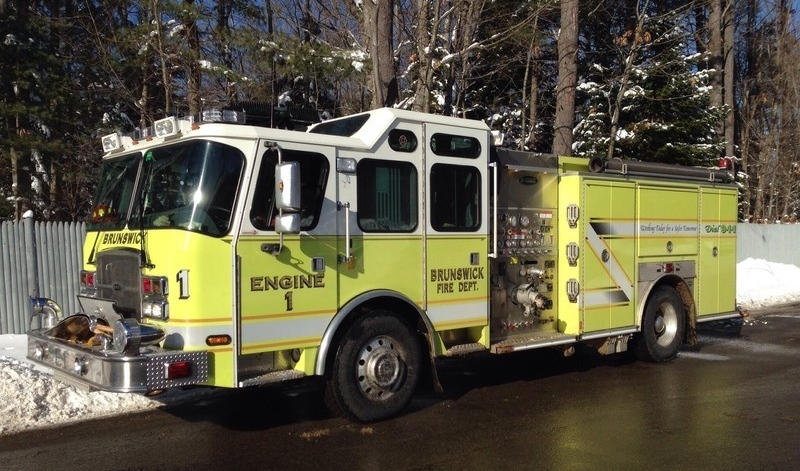 This time I am referring to the Brunswick Fire Department, who came to our house yesterday in their day-glo yellow trucks, lights flashing as they silently sidled up to the curb and bailed out in their yellow, tan and reflective gray regalia like so many astronauts. They came because Calvin's effing-breath-of-fresh-air nurse Rita, upon hearing for days our furnace had been struggling, and having smelled the fumes from our basement, suggested we call the BFD to come check for carbon monoxide. After all, and as she so humorously put it, she had some skin in the game. Minutes later they arrived, one by one making their way through the mudroom door and into the basement with gas masks on. Sure enough, we had low levels of CO on both floors and a pretty high level in the basement, so they shut down our furnace amid sub-freezing temps and said not to turn it back on. While the men forced out the toxic gas with a large fan, one of them carried Calvin, who had been lethargic and ataxic, out to the ambulance to keep warm. It brought back bad memories of too many 911 calls and trips to the ER due to prolonged seizures years ago. Inside the ambulance, Calvin propped against me, I called a few heating specialists who were recommended to me by friends on Facebook. I told them our dire situation while wondering if the carbon monoxide might have had something to do with Calvin's spate of seizures and his lethargy the previous three days. Thankfully, I got through to Al, from A&R, who my friend Sarah so highly recommended. Shortly thereafter, Woody came over and offered for us to sleep at his place if our house had no heat overnight. Mary and Cindie drove by on Calvin's bus worrying, having seen the fire trucks. Another friend offered us refuge for the night if we needed it. When the CO measured zero we were able to reenter our home. I thanked the firefighters (I had no idea how much I like firefighters!) and even hugged the one who carried Calvin back indoors. They were all very kind and gentle. I wish I had taken their photo. Last night, I remembered having had a waking nightmare about the three of us dying from carbon monoxide poisoning. Our furnace had been uncharacteristically failing to keep up the past two or more weeks which included several sub-zero nights, some as cold as minus fifteen, and days which struggled to reach the teens. I had repeatedly suggested to Michael that something was wrong with the furnace, but until we woke up to a house that was fifty-two degrees, he'd been in some kind of denial. After Al and Rita had left, Michael apologized for not having listened to me when I first suspected a problem with the furnace, and for giving me a hard time when I pressed him about it. "I'm sorry. I let you down, didn't I?," he said, then repeated the sentiment, earnestly. His first two words would have been enough, but characterizing his own behavior as having let me down reminded me of what a good man and husband he is, reminded me of the wedding vows we'd both written. In recounting yesterday's events, I am reminded also of the benefits of a well-oiled society. When our house is in flames or fumes, no matter if we are wealthy or poor, the fire department shows up. If we are being burgled or harassed, the police come to your door. Every week our garbage is picked up curbside. Our roads are paved and swept and plowed. In storms, our downed power lines are restored. No matter who we are, or what our means, we can be sure these things will be taken care of. It's about the betterment of society. We all pay into these services so that they will be available to anyone, thus making us safer as a whole. The same should be said of health care, which is a BFD (big effing deal). If we are sick or dying, we should be able to see a doctor for treatment or have a surgery or get chemo without having to worry about bankruptcy. It is for the betterment of society if we are all healthier individuals. Healthy people are able-bodied and are less of a drag on so many other social services as a result. Our nation could actually save money on healthcare costs if we supplied health care to all. To be sure, children suffer and die daily because they are born into hard-working families who don't have health insurance. Are they or their families deserving of their demise? Is our moral compass so out of whack that we choose to let certain families languish from neglect? Perhaps the very worst Americans would welcome those outcomes, or at least turn a blind eye to those deaths. Again, I think of those firemen carrying Calvin through the snow, just as I remembered their colleagues carrying him to the ambulance when he was tiny as a baby and seizing in their arms. Back then, and because we had health insurance, I never had to worry that the hospital would refuse us. I never had to worry about how much it would cost or if it might mean losing our home. The reality is, no one should have to. Our health is sacred, as is our safety, as are our homes. Why some folks think healthcare is a privilege for the well-to-do rather than a right for all, I'll never understand. Hi I’m glad all worked out Christy. As for firemen (and women) they are my heroes —- then, now and in the future. Few match their bravery and compassion. I've been worrying about you in reported frigid New England, and was not surprised to see this story. How scary! I'm so glad it turned out ok. Couldn't agree more about our universal community services/infrastructure, and about some appalling attitudes re everyone's right to health care. We are, after all, a society of human beings....let's live with that understanding! As a resident of Brasil, I wonder at how many Americans are appalled by faults in their country. When it comes to government services, civic price, health care, infrastructure, whatever, the USA has it very good. Part of that goodness comes from people standing up to change the status quo, making it better over time. Geez -- I am behind on reading your posts and just catching up. Carbon monoxide poisoning is so scary -- I am grateful that you had things taken care of so quickly and in time. I love the rest of your post -- it's clear, calm and restrained energy and anger.